When people think of Florida, the first things that normally come to mind are Disney World and seasonal hurricanes. But there’s so much more to this wonderful state that gives it a rich history, and bright future, and makes it a current hot-spot for politics, education and science, national military strength, and monetary power. 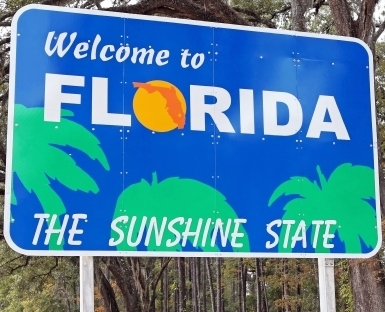 With Florida being such a popular tourist destination, it gives businesses a lot more drive by and walking traffic for them to advertise too. That is why outdoor promotions are so important to a business in the state of Florida. Feather flags are a very common and popular choice for outdoor advertising, because they are easily seen and are cost effective to a business large or small. Another promotional product are air dancers, these wacky waking inflatable tube dancers are sure to get the attention of anyone driving by and drive them right to your business. Customized banners can be used by any business because it helps branding their business for all people passing by to see. flowers, marshy fauna, and a woman standing on a beach with the sun on the horizon in the background of it all. The state flag is simply this seal placed on the crossing point of of a red “X” stretching from each corner. For being such a significant city in the state, Tallahassee has a remarkably “small town” feel. Located in the beginnings of the “Florida Panhandle” in Leon County, the state’s capital is also home to several well-known institutions of higher learning, most notably Florida State University and Florida A&M University. One the city’s greatest distinctions is having the third oldest police force in the nation. The Tallahassee Police Department was established in 1841, behind the Philadelphia Police Department and the Boston Police Department. This city which combines “college town” excitement with the seriousness of bureaucracy, government, law, and justice was established in 1824 in what was then a U.S. Territory. The state capital is also a base for scientific research, housing the National High Magnetic Field Laboratory which, as its name suggests, focuses on magnet research. This laboratory is the biggest and highest-powered of its kind in the world. Bordering the Atlantic Ocean, Jacksonville is the largest city by both size and population in this vacationing state. Located in the county of Duval, it is also the 13th largest city by population in the country with more than 1,300,000 people, as well as the largest in terms of land in America. Just south of the Georgia border (blocked only by the Floridian county of Nassau), Jacksonville was originally a French Colony in 1564 making it one of the earliest European settlements in the United States. Eventually coming to the U.S. by way of Spain in the early 1820s, the settlement was named after the President, Andrew Jackson who was also the first military governor of the then-territory. Now, it houses two U.S. Navy bases and one large deep-water sea port, making it the third largest military presence in America. While its local economy is known for health care, banking, and insurance, it cannot escape being a part of a high-traffic, tourist state. It is best known for its golfing, in that regard.